What are the symptoms of dry skin in babies? 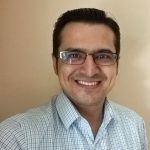 How to treat dry skin in babies? Dry, rough skin, and cracked patches. This isn’t a very pleasant sight, especially in your baby. Imagine all the irritation and pain that the baby must be going through! But, despite its critical outlook, the baby’s dry skin can be easily treated through simple home measures and seldom with medical intervention. MomJunction tells you everything about dry skin in babies and ways to treat and avoid the problem. To understand skin dryness in infants, we have to understand a newborn’s skin. 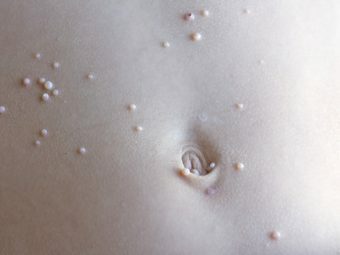 Babies are born with a whitish coating of vernix caseosa (1). The cream-like substance coats and protects the infant’s skin ever since it is a fetus. Vernix is wiped off the skin by a doctor after birth, exposing the baby’s skin to natural elements for the first time outside the uterus. As a result, the top layer of the skin dries up and sheds a few days after birth. Therefore, skin dryness is a common phenomenon for newborns. Experts state that newborns do not need any additional moisturization or lotions in the first month of their life (2). 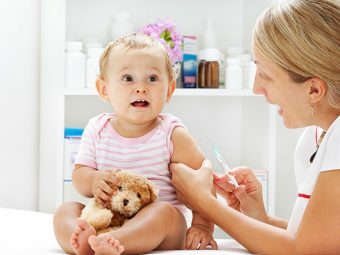 Nevertheless, parents can apply a lotion after consultation with a pediatrician. As the baby grows older, the dry skin develops as a response to certain external and internal factors. Weather: Extreme cold and heat can drop relative humidity, making the skin lose moisture and dry out at an accelerated rate. Surrounding temperature: If a home’s central heating system is set to a very high or low temperature, then the air in the house will gradually lose its moisture and dry out the baby’s skin. Long baths: Bathing the baby for too long can wash away the natural protective skin oils secreted by the sebaceous glands. Taking a bath in chemically-treated or chlorinated water can also damage and dry the skin (4). Harsh soaps: Standard non-baby soaps can be harsh on an infant’s skin, causing dryness. These were the usual conditions that a baby is quite likely to encounter in daily routine. But, did you know dry skin could also be an indicator of a serious skin problem? Eczema: Also called dermatitis, it is an allergic skin condition characterized by itchy rashes mostly on the cheeks and forehead. Dry skin rash is a leading symptom of eczema, with others being severe itchiness, red patches, scaliness, and cracking of the skin (5). Pityriasis alba: It is a type of eczema (dermatitis) that only affects the face, arms, and torso. It displays characteristic dry and scaly lesions that may become red over a period (6). Psoriasis: It is an autoimmune disease, where the immune system attacks the healthy skin cells. The symptoms are similar to eczema, but psoriasis is not a type of allergy. The symptoms include dry, cracked skin that bleeds (7). Cradle cap: Also called seborrheic dermatitis, it primarily happens on the baby’s head. Cradle cap is caused by the overproduction of skin sebum (oil), which glues together dead skin (8). The newborn develops greasy or dry flakes of skin that peel out to expose red patches. Multiple layers of dry skin on the scalp are common in babies with cradle cap. Ichthyosis: In this rare condition, the old skin cells do not fall off leading to a flaky, scale-like accumulation of dead skin throughout the body. The dead skin scales are extremely dry, flaky, and peel out when rubbed. The condition is caused by genetic mutations and usually makes its first display during infancy (9). Keratosis pilaris: The skin produces excess keratin, a protein found in skin, hair, and nails. The surplus keratin blocks the ducts of sebaceous glands causing tiny bumps resembling pinheads. The bumps are mostly seen on arms, legs, and buttocks. Rough and dry skin is a characteristic feature of this condition (10). Despite its critical outwardly appearance, keratosis pilaris is harmless and has no adverse effects on a baby’s health (11). There are a plethora of reasons behind dry skin in babies. But what most parents are often curious about are the precise symptoms. While dry skin can be easily spotted by parents and is a common condition, certain symptoms should be brought to immediate medical attention. These conditions are treatable and continue reading to find out how. Dry skin is caused due to a variety of conditions, and hence, the treatment varies. The various methods are mentioned below. Topical ointments such as eczema, psoriasis, and cradle cap provide relief and prevent dry skin. Such topical creams and ointments target the fundamental problem of dry skin. A moisturizing lotion is prescribed by the doctor for everyday use, depending on the intensity of the infant’s dry skin. Liquid bandages are given to infants with severely cracked and bleeding skin. Liquid bandages work like regular bandages and can be purchased over-the-counter without doctor’s prescription. i) Before application, the affected skin is washed and dried. ii) A layer of liquid is then applied on the skin using a brush-like applicator, which is included in the bottle of the liquid bandage. iii) The first layer is allowed to dry which is followed by the application of the second layer. iv)The liquid forms a transparent coating and protects the skin from cracking further. The applied liquid bandage is waterproof and lasts for a week. Once the skin below is healed, the solidified liquid bandage peels off on its own. A baby experiences relief from treatment. But did you know that dry skin can be easily prevented at home itself? Keep reading to learn all about it. Prevention and management of dry skin are easy, and all you need to do is follow some simple steps and procedures. Limit an infant’s bath time: Spending too much time in the tub, especially in hot water, can wash away natural skin oils, leaving the skin bare and susceptible to dryness. Experts recommend limiting the bath time to not more than ten minutes with warm, and not hot, water (12). If the baby loves playing in the tub, then let him in the tub without water or shallow water and top the tub with water just before bath. Avoid harsh soaps: Always use soaps that are specially made for babies as they are free of harsh and harmful chemicals. Choose bathing/shower gels and liquid soaps with added moisturizers as they are mild on the skin. If choosing a soap, use ones that have added moisturizers such as oils. Avoid soaps that contain alcohol and added fragrance as they can dry the skin quickly. Use moisturizing lotions after bathing the baby: Moisturize the baby’s entire body immediately after a bath, with a head-to-toe lotion. The fat in the moisturizer forms a thin layer on the skin, which replenishes and prevents further loss of moisture. Using moisturizers is the safest home remedy for a baby’s dry skin. Select clothes made of natural fabrics: Natural fabrics such as cotton are gentle on the skin as they are non-abrasive and let the skin breathe easily. If the baby has dry skin, then it is important to switch to cotton clothes. Use baby laundry detergent: Laundry care does not end with natural fabrics. You must wash them only in baby laundry detergents. Look for a detergent meant for the laundries of a baby with sensitive skin. Use a humidifier: Dry air is the worst enemy of a baby’s skin. Use an indoor humidifier in your baby’s room, as it maintains a steady level of air moisture content and prevents water loss from the skin. 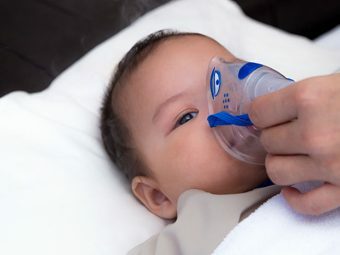 The American Academy of Pediatrics (AAP) recommends the use of only cool-mist humidifiers for babies (13). Dress the baby properly in winter: Dress the baby in proper winter clothes especially when taking him outdoors. The cold air is devoid of moisture, which can increase the skin dryness and worsen the existing dry skin patches. Cover the baby’s hands with gloves and put on a full-sleeved jacket. A cap can cover the ears and scalp. Keep the baby hydrated in summer: Hot weather also has low humidity. In such conditions, give the baby lots of fluids like water and breastmilk. Exclusively breastfed infants can have extra feeds. Simple steps for prevention and management keep the baby away from the effects of dry skin. But it does not stop there. Staying vigilant for even the faintest signs of dry skin could be the first step in treating diseases such as eczema and psoriasis. Keeping things that way also ensure the baby has a silky smooth skin. Have something to share about baby’s dry skin? Let us know your thoughts in the comment section below.